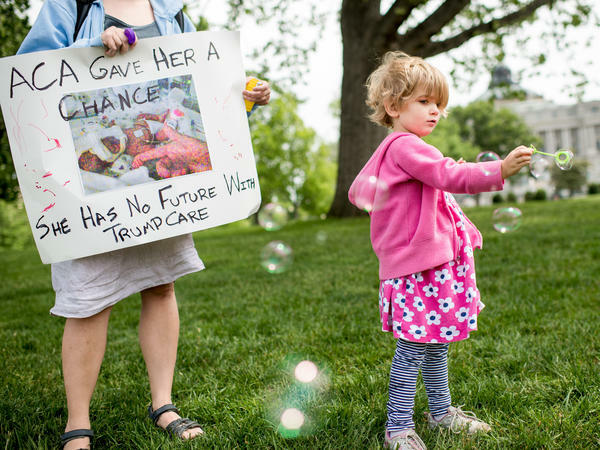 Charlie Wood of Charlottesville, Va., plays with bubbles during a May 4, 2017, rally near the Capitol to oppose proposed changes to the Affordable Care Act. Charlie was born a few months prematurely, and her mother, Rebecca (left), fears changes to the health law will negatively affect her care. But that mandate was crucial to persuading insurers to offer plans under the ACA. It helped expand their risk pools while the law forced them to guarantee coverage to any customer. Insurers were not allowed to raise costs for people with pre-existing medical conditions. The administration's legal brief, filed Thursday in federal district court in Fort Worth, Texas, takes aim at those links. Twenty Republican state attorneys general filed suit on Feb. 26, charging that Congress' changes to the law in last year's tax bill rendered the entire ACA unconstitutional. In the tax law, Congress repealed the penalty for people who fail to have health insurance starting in 2019. The attorneys general argue that a Supreme Court decision in 2012 saved the ACA from being declared an unconstitutional overreach of congressional power by declaring the penalty a tax — and pointing out that Congress has the power to levy taxes. Without the tax penalty, they argue, "the Court should hold that the ACA is unlawful and enjoin its operation." The Trump administration Thursday did not go that far. Rather, it argued that without the tax to encourage healthy people to sign up, the parts of the law guaranteeing coverage to people who have chronic illnesses or other pre-existing health conditions should be struck down as well. The administration called on the court to declare that the provisions that guarantee coverage will be "invalid beginning on January 1, 2019," when the mandate penalty goes away. 1. If this lawsuit succeeds, who will be affected? People who buy their own insurance, usually because they are self-employed or don't get coverage through their jobs or the government, will be vulnerable. There are about 21 million people who do so, buying either through insurance brokers or from a state or federal Affordable Care Act marketplace. But it's not clear exactly how many Americans have pre-existing conditions and could be affected. Estimates vary widely because there is not a standard definition of what counts as a pre-existing condition. Before the ACA passed, insurers commonly refused coverage for people with cancer, heart failure, diabetes, arthritis and even less serious conditions. Based on those pre-ACA examples, the Kaiser Family Foundation estimates that 27 percent of people under age 65 have a pre-existing condition. Of course, not all of them buy coverage on their own. On Friday, America's Health Insurance Plans, an insurance industry trade group, criticized the federal government's filing. "Zeroing out the individual mandate penalty should not result in striking important consumer protections" that help guarantee coverage to people with pre-existing conditions, a written statement from the group said. "Removing those provisions will result in renewed uncertainty in the individual market, create a patchwork of requirements in the states, cause rates to go even higher for older Americans and sicker patients, and make it challenging to introduce products and rates for 2019." 2. Is anything going to change right away? What about next year? Don't look for big changes quite yet, though the move could boost premiums and reduce choices among plans as early as 2019. The lawsuit could easily go all the way to the Supreme Court before there is a resolution, which could take years. So the pre-existing condition protections are likely to stay in place during that period. More immediately, there might be some effect on premiums for next year. Health insurers are currently deciding whether to sell coverage in the individual market in 2019 — and what they're going to charge. "The more uncertainty there is, the more the actuaries are going to be plugging into their projections for premium rates," says Sabrina Corlette, a research professor at Georgetown University's Health Policy Institute. But others say the legal brief may have minimal impact next year on premiums. That's because insurers already expected the Trump administration would not defend the ACA — and they know that a resolution of the case will be years away, says industry consultant Robert Laszewski. A bigger effect on premiums, according to both Corlette and Laszewski, are factors already in play that are expected to draw younger and healthier people out of the ACA marketplace. Those include Congress' decision to repeal the individual mandate penalty and rules expected soon from the administration that will expand the market for lower cost and short-term policies that won't have to follow all the ACA rules. 3. How is this lawsuit different from previous challenges to the ACA? The Supreme Court has twice upheld the constitutionality of the health law. Most famously, in 2012, a narrow majority led by Chief Justice John Roberts turned back a challenge that was also filed by Republican attorneys general along with the National Federation of Independent Business. Roberts wrote in a 5-4 ruling that the requirement for most Americans to either have insurance or pay a fine constitutes a tax — even though Democrats had gone to great lengths to not call it a tax — and was therefore constitutional. This current lawsuit, led by Texas Attorney General Ken Paxton and Wisconsin Attorney General Brad Schimel, argues that since Congress has changed the law to remove the penalty forcing individuals to get insurance, it has inadvertently rendered the rest of the law impermissible, under the 2012 Supreme Court ruling. "Texans have known all along that Obamacare is unlawful and a divided Supreme Court's approval rested solely on the flimsy support of Congress' authority to tax," said Paxton when the suit was filed. "Congress has now kicked that flimsy support from beneath the law." Other legal observers point out that's not how the lawmaking process works. "Congress is always free to amend its statutes, even to omit what it previously thought was essential," writes Nick Bagley, a law professor at the University of Michigan, in a Thursday evening blog post. "That's what Congress did when it zeroed out the mandate. So we don't have to speculate what Congress would've done if it had a choice between invalidating the ACA's insurance reforms or just invalidating the mandate. Congress made that choice." 4. If the Trump administration isn't going to defend the health law in this lawsuit, who will? In May, the court allowed more than a dozen state attorneys general, all Democrats, to "intervene" in the case and defend the law. "The goal of Texas' lawsuit is to leave Americans without health insurance, forcing them to choose between their health and other needs," says California Attorney General Xavier Becerra. Allowing the Democratic officials to join the suit "allows us to protect the health and well-being of these Americans by defending affordable access to health care." 5. If nothing is going to happen right away, why is this such a big deal? The guarantees for coverage for people with pre-existing conditions are among those most valued by the public. Even if the lawsuit stands little chance of success, putting those provisions back in play can create uncertainty for insurers and patients this summer and fall. It could also possibly provide Democrats another talking point for the coming midterm elections in November. Legal specialists also point out that the Trump administration's failure to defend the federal health law could have long-lasting implications for the rule of law in the nation. "If the Justice Department can just throw in the towel whenever a law is challenged in court, it can effectively pick and choose which laws should remain on the books," wrote Bagley. "That's as flagrant a violation of the President's constitutional duty to take care that the laws are faithfully executed as you can imagine." Kaiser Health News, a nonprofit news service, is an editorially independent program of the Kaiser Family Foundation and is not affiliated with Kaiser Permanente.